Houses once stood on the land that is now John Howell Park, and the Inman School's trailers and playing fields. This plat mapped out the land lots for those houses. 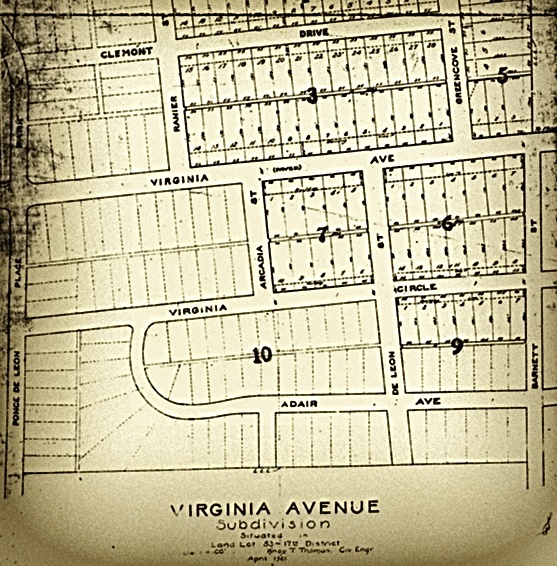 About a year ago, we posted 22 historic plat maps of various subdivisions that are now part of Virginia-Highland — these are the maps on which surveyors originally plotted how the land was subdivided into the lots that, for the most part, still exist today. 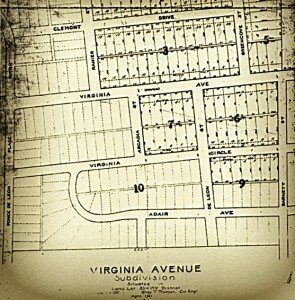 To explore the maps, you can start by viewing the map of Virginia-Highland (“Map of Maps”), then select your specific area, then click through all available maps for that sector. 23 – N. Highland NW of Virginia Ave.
27 – Briarwood Rosedale Rd. 37 – Rosedale Rd. N of Virginia Ave.
38 – Hancock land – Stillwood Ave.
46 – Virginia Ave. curve at Rosedale Rd. 47 – Hancock land – Stillwood Ave.